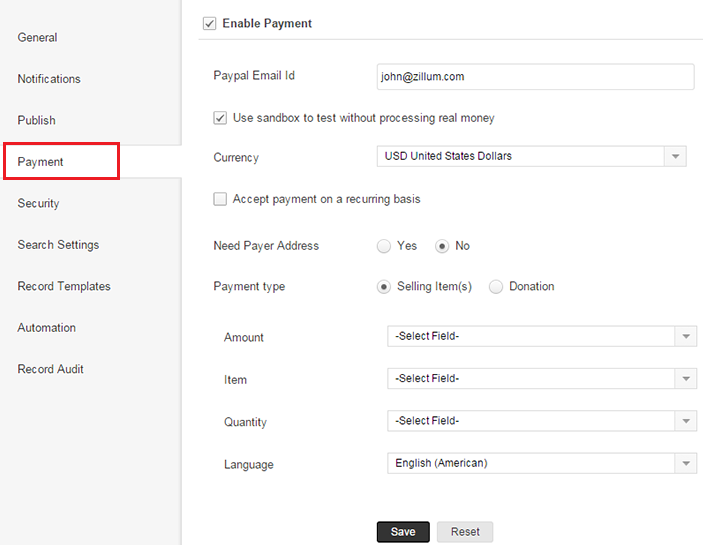 You can configure the Forms in your Zoho Creator Application to collect payment from your users. Payments can be collected on a “recurring” or a “non-recurring” basis. Collecting order payment - A user places an order on your Form, and has to pay for the items that have been ordered. Collecting registration fee - A user registers for an event like a workshop, certification programme, webinar etc., on your Form, and has to pay a registration-fee. Collecting donations - An organization, especially a not-for-profit or non-governmental (NGO), may create a Form through which users can make donations to them. Selling subscriptions - A user can purchase subscriptions, for which he can make the payment for the 1st month, and the subsequent months' payments are done automatically on a recurring basis. Once the “Payments” feature has been successfully configured, users are taken through various steps of payment after the Form submission. Payment details like Items purchased, Quantity, Total Amount etc will be taken from the details submitted in the Form itself. Hence, the payment configuration will include mapping of Form fields to payment fields. For example, the “Amount” field in a Form can be mapped to the payment amount. In this case, the amount entered in the “Amount” field while adding the record, will be used as the payment amount. If there are any On-Success scripts, they will be executed only after the transaction is complete. Open the Form Settings -> Payment tab. Select the Enable Payment checkbox to configure the parameters, as shown below. To disable payment, uncheck Enable Payment. The configurable parameters shown in the above image, are explained below. Specify the required values and click Save to configure payments for the Form. 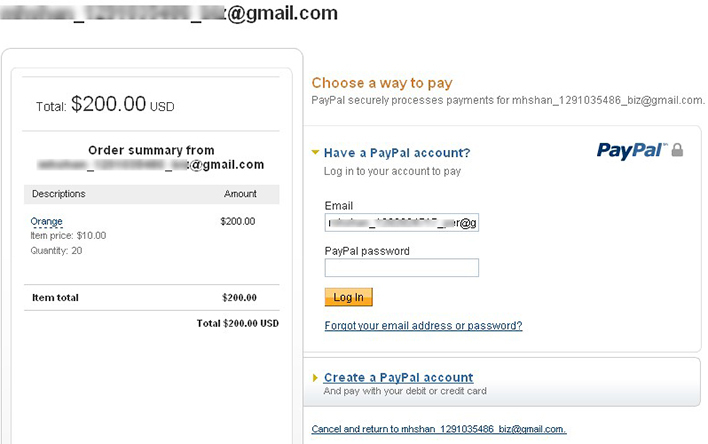 Paypal Email ID: Specify your Paypal account's email address. This should be a “business account” for accepting payments. You can create a Paypal business account here if you don't already have one. Use sandbox: Select this option to test the payment process using Paypal's sandbox environment. Uncheck it once the testing is successful. If the field's currency is a valid Paypal currency, then the field's currency is sent to Paypal. If the field's currency is not a valid Paypal currency, the currency that is configured in payment settings is used. In both the cases, the original amount entered in the Form field is used; no exchange rate calculations are performed. Accept payment on a recurring basis: Check this option if you want your users to make the payments periodically. Also specify the recurring interval in terms of days, weeks, months or years. Once configured, Paypal will obtain the authorisation from the payer (either a Paypal account or a Credit/Debit card) and debit their account on a recurring basis at the specified interval. Learn more about configuring recurring payments. Need Payer Address: Choose if your users have to specify their address while checking out at the Paypal website. Payment Type: Refers to the different use case scenarios of accepting payments. "Selling Item(s)” option is typically used when you want to sell products. It allows a user to buy a product, at the given rate specified in the "Amount" field, and the quantity specified by the "Quantity" field. The "Donation" option is used when you are collecting donations from your users. Note that when you select "Collect Donation", the "Quantity" field is hidden since quantity does not apply to donations. Payment Fields - Various Form fields can be mapped to the payment fields, so that the requisite field-data from the added record is sent to Paypal. Amount - Refers to the amount that is paid in the case of "Donation" and price of an item in the case of "Selling Items". It can be one of the numerical field types (Number, Decimal, Currency). Item - Useful for referring to the purpose of payment. It can be used as the product name, payment remarks etc. It can be one of the string field types (Single Line, Multi Line etc.). Quantity - Refers to the quantity of items in an order. It can be one of the "Number" fields in the Form. If this field is left, the quantity value defaults to 1. Language: Choose the language in which the paypal checkout pages will be displayed. Leave the Accept payment on a recurring basis option unchecked, and specify other parameters as explained in the Enable payment for Form section. When the Form is submitted, the user will be redirected to the Paypal site for payments. On-Success scripts are put on hold until the transaction is over. Note: A payment can be initiated only when a new record is submitted through the Form. It cannot be initiated when a record is edited/updated. Thus, a payment cannot be initiated when records are added through script, or imported, or any method other than adding through Form. In the Paypal site, after the payment is done, the user can click the "Return" button to return back to Zoho Creator. When the transaction is complete, Paypal sends all the payment details to Zoho Creator separately. Zoho Creator processes the information, stores the payment details, and maps them to the respective record as an additional subform field. The user will now be presented with the results of the "On Success" scripts. Select the Accept payment on a recurring basis checkbox, and specify other parameters as explained in the Enable payment for Form section. When the Form is submitted, the user will be redirected to the Paypal site for subscription purchase. On-Success scripts are put on hold until the transaction is over. Payment takes place only when a record is newly added. It is not done when a record is edited through Reports. Payment also does not take place when records are added through script/import or any other methods. Once the data is validated and added, the user is redirected to the paypal site for subscription purchase. In the Paypal site, after the user purchases the subscription(to allow recurring payments), they can click the "Return" button to return back to the Zoho Creator. When the user purchases the subscription, the subscription sign-up details will be sent to Zoho Creator. Zoho Creator will store the subscription sign-up details, and map them to the added record as an additional subform field. Paypal will henceforth take care of debiting their account on a recurring basis as per the specified interval. Each time the recurring payment takes place, Paypal will send the payment details. As in the Non-Recurring process, Zoho Creator will store the payment details, and map them to the added record. Lookup and Formula fields can also be used for field mapping if their values are of the appropriate type. For example, if a Formula field resolves to a numerical value, it can be used as the "Amount" field (the Formula field will be listed in the dropdown). Similarly if the Form contains a Lookup which refers to a "Number" field, it can be used for "Quantity". Even if drop-down fields are filled with numbers, they resolve only to string type. Hence they cannot be used for "Amount" or "Quantity" field, but can be used for "Description" field. If a Form is embedded in a webpage using Iframe, then payment redirection will take place only through the main window and not through the Iframe. Paypal does not allow payments to take place in an Iframe for security reasons. Set Payment Data Transfer to "Off"
1. I want to accept payments from my users. What are the prerequisites? You need a Paypal business account to accept payments from your users. Please check https://www.paypal.com/cgi-bin/webscr?cmd=p/gen/personal_vs_business-outside for more details. 2. Is it possible to test my payment Form with virtual currency before I expose it to the users? Yes. It is possible to test your payment Form with virtual currency through Paypal Sandbox site. To create a test setup, follow the steps below. Create atleast one business account and personal account. Please check https://cms.paypal.com/cms_content/US/en_US/files/developer/PP_Sandbox_UserGuide.pdf for more details. Use the business account created above while configuring the payment settings in Zoho Creator. Ensure that “Use Sandbox” option is selected. Use the personal account created above during checkout. 3. I already have a Paypal account. Can I use it in Sandbox? No. Paypal maintains separate setup for Live and Sandbox. Hence a Live Paypal account cannot be used in Sandbox or vice versa. 4. Can a stateless Form be used to submit payment and in the on success script can we write code to manipulate data in the records of another Form? No. Currently, we support payments only through Regular Forms. 5. I see a new field labeled “Payment” in my view. What is it useful for? The “Payment” field maintains a list of transactions that have taken place for a particular record. While it will have one transaction for a non-recurring transaction, it will maintain a list of transactions for recurring transactions. 6. 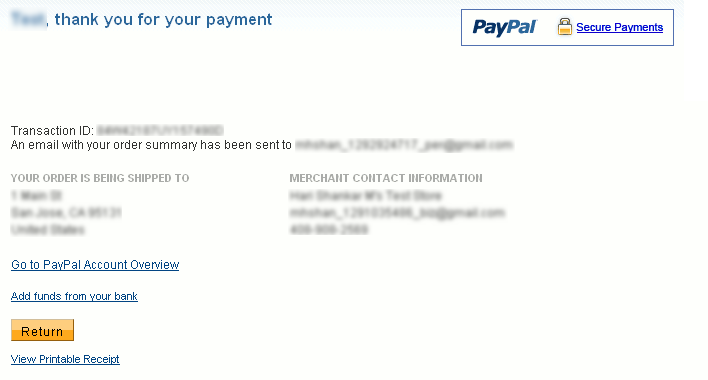 I have embedded the Payment Form in my website. But it leaves my website and gets redirected to Paypal. The payment Forms are embedded using Iframes in your website. For security reasons, Paypal does not allow payments through Iframe. Hence the behavior. 7. What happens if the return button is not clicked? Will the On-Success script run in such a case? Yes. Even if the users do not click the “Return” button in the Paypal website, the On-Success script will run. This is achieved through a background handshake between Zoho Creator and Paypal, wherein Paypal sends the transaction details to Zoho Creator. 8. Can you elaborate the recurring payment process? How payments are obtained from users at a periodical interval? Zoho Creator Forms can be configured to accept recurring payments. When users add a record to such a Form, they will be redirected to Paypal sending along with, the recurring amount and duration details. Once they authorize the payment, a subscription profile will be created. After this profile is created in Paypal, aka “subscription signup”, Paypal will take care of obtaining the recurring payments on a regular interval based on the recurring duration setup in the payment configuration, till the profile is canceled by the user. Please check this link for more details. 9. How do users cancel subscription? In case they contact us, how do we cancel their subscription? Users can cancel subscription through the Profile pages in their account. Please check https://www.paypal.com/helpcenter/main.jsp?cmd=_help&solutionId=27715&t=solutionTab for more details. 10. Will we get intimated whenever users pay? Yes. Whenever any payment takes place, the details are sent by Paypal to Zoho Creator. Zoho Creator processes those transactions, stores them and links them to the record in the Payment Form that initiated the payment, through the “Payment” field. 11. If a user's payment fails for a particular period, will we be intimated about it? In case we need to check manually, what should we do? Yes. Any events taking place in Paypal will be intimated to Zoho Creator. Zoho Creator will process, store and link those details to the record in the Payment Form that initiated the payment through the “Payment” field. 12. I see only “Selling Items” and “Donation” as payment types. What should I do if I want to create a registration Form, fee collection Form etc ? As long as the Form contains a string field to map as a payment item name/remark/description and a decimal/currency field to map as the payment amount, any stateful Form can be can be configured for payment. To achieve this, create the Form with the required fields. Open the “Payment” dialog from the Form Edit. Configure your Paypal settings, select “Selling Items” type and then map the Payment fields. If you want the payments to be marked as donation, select “Donations” type instead. 13. I want my users to choose a donation amount from a dropdown of present donation amounts. Is it possible? Yes. Follow the steps given below. Create a Single-Item selling Form through the Create Form flow. Go to the edit mode of the payment Form. Click the “Payment” link to open the “Payment Settings” dialog. Change the payment type to “Donations” and save. 14. I want to send Emails (in general, any post-payment processing) to my user confirming their payment. How do I do? You can achieve any post-payment processing through the On-Add On-Success script. You can use the following code template to perForm any post-payment processing. //Loop through all records in ZC_Payment subForm field. //payment_processing_status will be "" for records that are not processed. //Once the On-Success script finishes successfully, its value will be "Completed". Skip them here. //If the On-Success script finishes unsuccessfully, its value will be "On Success Error". Skip them here. //Check if it is payment transaction. //Make sure the payment_status is "Completed". //Check if it is a subscription signup. //Check if it is a subscription cancellation. //Check if it is recurring payment transaction. 15. What payment fields can I use in my On-Success logic? The following fields can be used through the ZC_Payment subForm. all_params - The consolidated value of all parameters received from Paypal, delimited by "&"
payment_processing_status - The processing status of this record. payment_type - The funding sources for the payment. payment_date - The time when the payment took place. It is empty for non-payment transactions, like subscription signup/cancel. payment_status - The status of the payment transaction. address_status - The address status of the payer. payer_status - The status of the payer. first_name - The first name of the payer. last_name - The last name of the payer. payer_email - The email id of the payer. payer_id - A unique value to identify the payer in Paypal. business - The Paypal business Email Id to which payments are made. receiver_email - The primary Email Id of the receiver. receiver_id - A unique value to identify the receiver in Paypal. mc_currency - The currency in which the payment is made. It is empty for non-payment transactions, like subscription signup/cancel. mc_fee - The fee taken by Paypal for the transaction. It is empty for non-payment transactions, like subscription signup/cancel. mc_gross - The total amount paid by the payer. It is empty for non-payment transactions, like subscription signup/cancel. txn_id - A unique transaction id generated by Paypal for the transaction. It is empty for non-payment transactions, like subscription signup/cancel. mc_amount3 - The regular subscription amount setup in Paypal. This has a value only when txn_type is “subscr_signup”. Period3 - The regular subscription interval setup in Paypal. This has a value only when txn_type is “subscr_signup”. 16. Once the user finishes payment, I want to redirect them to a different page instead of the payment Form. How do I do that? Configure the url in the Edit Form – More Options – Form Properties dialog. Configure the next url while embedding. More details..
Use the OpenUrl task in On-Success script. More details..